The Central Reserve Police Force (CRPF) conducts a recruitment examination for recruitment of suitable Indian nationals to the post of Assistant Sub-Inspectors (Steno) in the Central Reserve Police Force (CRPF).The recruitment to the post of Assistant Sub-Inspectors Steno in the BSF is done on the basis of written examination, physical test and medical test and this book has been designed for the written examination conducted by CRPF. The present book for CRPF ASI Steno(Male and Female) Recruitment Examination has been divided into two parts covering English Language, General Intelligence, Numerical Aptitude, Clerical Aptitude, Essay Writing and Letter Writing, Traditional General Knowledge and General Affairs, each sub-divided into a number of chapters. Each chapter in the book contains ample number of solved problems which have been designed on the lines of questions asked in previous years’ examinations. Also unsolved practice exercises that have been designed strictly based on the syllabus and examination pattern have been provided at the end of each chapter for thorough practice and preparation. The General Intelligence section covers Verbal as well as Non-Verbal Reasoning with large number of practice questions. The English Language section covers the basics of English grammar and comprehension with ample number of solved questions. As the book contains ample number of solved questions along with a model paper for practice, it for sure will help the aspirants score high in the upcoming CRPF ASI Steno Recruitment Examination 2017. 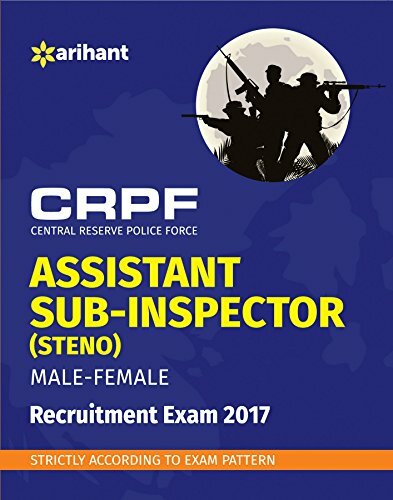 Buy the book CRPF Assistant Sub-Inspector (Steno) 2017 from Ideakart.com.